The double-loop wires are produced open to be inserted in pre-punched holes of the suitable dimensions. Once inserted in the proper holes they are simply crimped closed with a wire closer. The 3 to 1 (3:1) pitch is used for books up to about 12mm thick and 2 to 1 (2:1) wire can be used for books up to about 30mm. 2:1 wire is recognisable as the holes are larger than those produced for 3:1 binding and are spaced further apart. There are 23 holes on an A4 size sheet when it has been punched 2:1, 3:1 has 34 holes on an A4 sheet. Useful tip: Are you wanting to bind a book that is greater than 14mm thick? You can now use the same 3:1 punching machine and use our specially made 3:1 plastic spirals instead of wire. 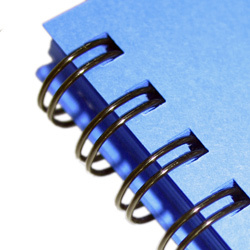 With 3:1 wire binding you are limited 14mm thickness before requiring a larger punched hole. But with our 3:1 plastic spirals you can now bind up to 45mm, extending the function of your current equipment. 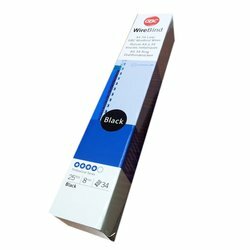 Ideal for situations where you have punched a book that is thicker than 14mm as you can now use plastic spirals rather than having to reprint. Contact Us and we will do our best to match it on these items.